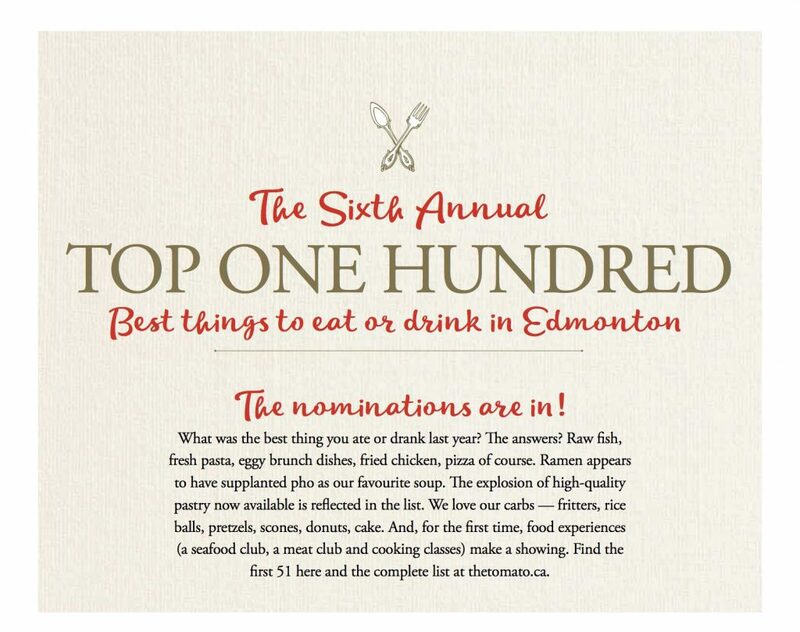 The Top100 is the Tomato Food & Drink Magazine’s annual list of what’s tops in food and drink in Edmonton. Readers are asked to nominate their favourite bite or sip—whether it’s a dish in a restaurant or a farmers’ market favourite; a cocktail or a snack food; a condiment or a treat. They enter via Twitter, Instagram, on our Facebook page, email, phone and even by mail. Since debuting the list in 2013 on the anniversary of our 100th issue, the Top 100 has grown into a culinary cultural happening. Enthusiastic food lovers send thousands of recommendations, as well as odes and love letters about the dishes they crave. The process paints a picture of our evolving food culture; what’s trendy, what’s not and what’s truly delicious. People shape our food scene. We love that the Top100 is the place for the conversations that help create Edmonton’s culinary landscape—after all, everybody eats. TAKE A BITE OF YOUR CITY. TAKE A BITE OF THE TOMATO.